Still on hols, lovelies, so here’s Julia from Stylonylon bringing you a holiday-themed post! Enjoy!! Hello everyone! I’m Julia from Stylonylon and I’m thrilled to be guest-posting today for Maria while she’s away. One of my favourite posts (I know, I know, they are everywhere!) is What’s In My Handbag . 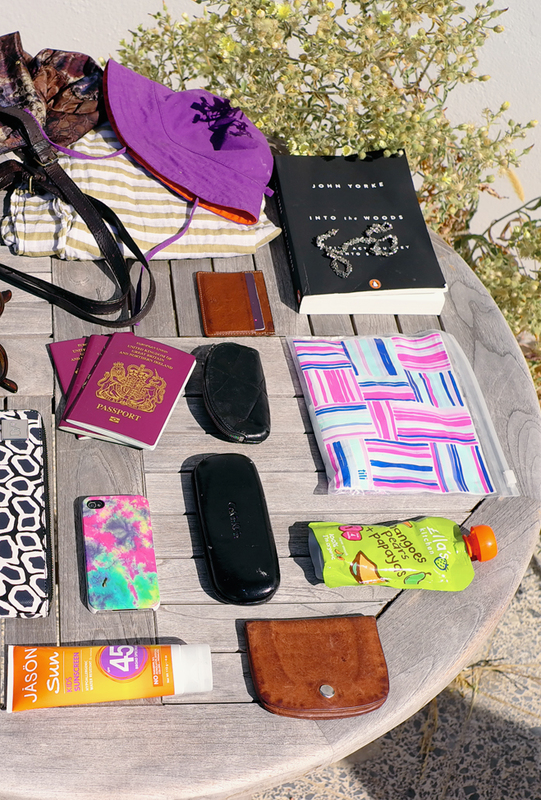 So I thought I’d take you through my travel handbag, as we’ve just jetted off for sunnier climes. Polarn O Pyret baby hat (reversible) – such as this gorgeous purple/orange number from one of my favourite Swedish kidswear brands. Book – Not mine, my husband’s. I read all my books on Kindle on my iPad (currently reading Daughter of Smoke & Bone (as recommended by Natasha from Girl in The Lens, she totally knows her YA!). Vintage necklace – Always handy to spruce up an outfit. Mulberry cardholder (similar here) – Perfect for slipping into a pocket if you’re popping out without a bag. Mulberry keyholder – Carrying keys around in a little case means you’re less likely to lose them – promise! (All my lovely Mulberry accessories are birthday presents from mummy Stylonylon, an original Mulberry fan from before the days of the It bags!). Tili bags – I’ve recently discovered these pretty little zip lock bags, courtesy of my fave new beauty site A Beautiful World. They are so handy and in these two I have 1) baby wipes and 2) a selection of organic lip balms (Dr Bronners, SW Basics & The Bakewell Soap Co), my favourite Shea Butter Cream and Know-It Oil (shea and coconut are so hydrating and are multi-purpose – hands, face, grazes etc) and Tisserand Frankincense oil (for mummy Stylonylon – great for soothing mosquito bites apparently!). Ray Ban Wayfarers – Tortoiseshell. Natch. DVF iPad case (recent sale purchase) & iPad – Brilliant baby distraction (so many brilliant kids’ apps) and for reading/planning blog posts when the little one’s sleeping. iPhone – I can’t live without it and when I clapped eyes on this Henry Holland SS13 case (handed out at the show) I had to have it. Luckily I found it on good ol’ eBay. The Vintage Cosmetic Company emery board – I always have one handy for snagged nails. Calvin Klein spectacle case – For tucking away my specs on fights. Ella’s pouch – Handy, easy, organic fruity mush for little ones. Ally Capellino coin purse – Such a gorgeous leather, it just gets better with age. Jason’s Kids Sunscreen 45 – A natural sunblock that doesn’t turn you completely white. Handprinted business cards – I bought a hand-printing machine and plain cards from eBay to make my own DIY cards. 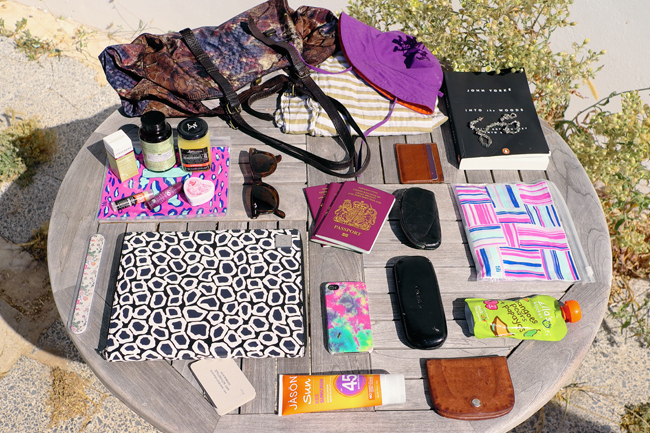 So, I hope you enjoyed this travel edition of What’s In My Handbag – a bit excessive? Or do you travel loaded down as well? :) Do pop over and say hi at stylonylon.com. This is easy, because my favorite all time singer has been my favorite all-time singer since I was 8 years old. My daddy used to stack up the 33 1/3 rpm records and I couldn’t wait for this one to drop onto the record player so I could hear her and sing aln2&g#8o30;Ladies and Gentlemen,Miss Patsy Cline!